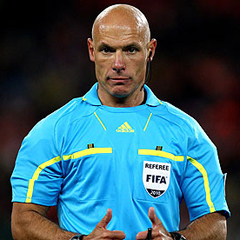 Cape Town - Howard Webb will referee Sunday's key Premier League match between Manchester United and Liverpool at Old Trafford. Kick-off is 15:30 SA time. According to the BBC website, Webb has not taken charge of the fiery fixture since an FA Cup tie two years ago. In that game, which Liverpool lost 1-0 at Old Trafford, Webb controversially awarded a penalty against the visitors and sent off skipper Steven Gerrard. Their then winger Ryan Babel was fined after posting a mocked-up picture of Webb wearing a United shirt on Twitter. Webb, 41, made history in 2010 when he became the first man to officiate the final of both the Champions League and the World Cup in the same year. United currently sit top of the Premier League standings, with Liverpool in eighth, some 21 points adrift of their bitter rivals. In Sunday's only other match, Arsenal entertain Manchester City (18:00) at the Emirates Stadium.